Today, more than half of global web traffic is generated through mobile devices. 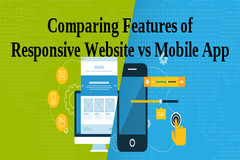 Web developers have worked hard to ensure that their web pages can adapt to the new era of smartphones and get better ratings of Google's mobile ranking algorithm. This massified the use of responsive websites to avoid falling behind in the race. However, this has only created new problems. Today developers have no choice but to choose between responsive websites or mobile apps for their companies. At first glance, both options may seem very similar, but they are not. In theory, a responsive website is like any other web page: it uses HTML pages that can be accessed from any browser, but is adapted to the smaller screens of mobile phones and tablets, thanks to a special design based on queries from CSS means that the content adapts to any type of screen. It requires less time: creating a mobile website is a faster process than designing an app. It is also much easier to support the website and keep it operational than to properly update an app. Cost: Responsive Web Design is comparatively cheaper compared to the costs of designing a native mobile app from scratch. Compatibility: a mobile website is available to all users and doesn´t require download or installation. In addition, most sites are free. Regardless of the operating system, as long as you have Internet, it works. However, we must be aware that responsive mobile sites are not as fast or as functional as native apps. It takes a long time to navigate to a mobile site through a mobile browser compared to an application, and its performance is slower. For its part, applications are true programs that are downloaded and installed on your smartphone, and work differently. The app can extract content and data from the Internet or download it to use it without Internet. They offer a unique user experience. Security: apps can guarantee greater security than browsers. They work without Internet: the applications can work without connection using the content already downloaded from Internet. Prioritizing special functions: in cases where the company chooses to use at the same time a responsive website and a mobile app, the latter doesn´t need to duplicate the characteristics of the website. Personalization: if your users need software to work in a personalized way, it is certainly preferable to use a customizable app, such as EverNote. Use of hardware: the mobile app, being native, can work directly with the phone's hardware, such as microphone, camera or GPS. The only big disadvantage of mobile apps is the time and money required to create a minimally good mobile app to compete in the market. In general, as a summary, we can say that a company launches a responsive website to attract new customers, and a mobile app for regular customers who are already used to the company. We believe that the choice between responsive websites and mobile apps should be made on the basis of time and available resources. If you have time and resources to spare, you can opt perfectly for mobile apps, which work better and have more features. You could even implement both solutions, because they are not necessarily exclusive.